Another wonderful oil to use when feeling stressed is chamomile. There are actually 3 types of chamomile, including Roman and Moroccan, but today we will concentrate on Roman Chamomile. Roman Chamomile was first used by the Egyptians and then introduced into later civilizations. It is believed that Roman Chamomile is useful for a variety of conditions including: Depression, anger,anxiety, insomnia, neuralgia, psoriasis and PMS. It is soothing to the mind and for the body has anti-inflammatory benefits. The flowers of the chamomile plant are actually very pretty, and resemble a daisy. It has a sweet apple like odor. It can be combined with other oils such as; Lavender, Clary Sage, Rose and Bergamot to name a few. Try these suggestions, and feel the tension of the day melt away! Before going to bed, draw a warm bath, and put a few drops of lavender in the bathwater. The steam will disperse the fragrance. Drop a small amount on your pillow case, this will relax you, on your way to dreamland. Mix a few drops of lavender with epsom salts for a soothing foot bath, (Epsom salts are natural and great for sore muscles. They can be bought very cheaply). Diffuse the lavender oil in a ceramic burner, or put a few drops on a light bulb oil warmer. Disperse some on a bowl of unscented Potpourri and place in your office. Of course, with all oils, there are different grades. Some are stronger than others: NEVER, put a pure oil directly onto the skin, it could result in irritation and even burning. It should always be diluted with a carrier oil, if used directly on the skin. For a bath and body treat, enjoy a total sensory experience with Relax Body Oil. The need to mix with other oils has been completely eliminated. Lavender is blended with oils of roman and german Chamomile. You will not only smell wonderful, but feel wonderful, with the luxurious base of coconut, sweet almond, jojoba, wheat germ oil, and vitamin E. Either pour into running water, or use as a massage oil. Next week we will be featuring another oil, with ways to easily incorporate use into your everyday life. In the meantime relax and enjoy! Have you ever walked through a garden and caught a whiff of a spectacular flower? Perhaps that scent triggered a memory, or even pleasant feelings. That is exactly how Aromatherapy works. By inhaling the oil from a plant or flower, different moods are evoked. 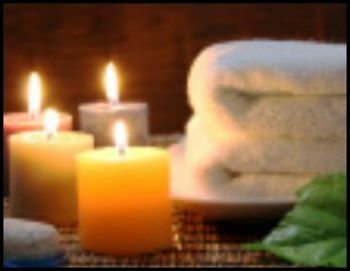 You can be rejuvenated and stimulated, or feel calm, and relaxed! This week, we are going to focus on the rejuvenating powers of the lavender plant. Lavender comes in many different varieties, that are grown all over the world. From english lavender to spanish lavender, to yellow lavender. In fact there are too many varieties to mention! My personal favorite is french lavender. My name is Jameel Nolan, I’m 28 years old and mother to a 5 ½ year old boy and engaged to a wonderful man that supports me in everything I do with my business. I started making candles approximately 11 years old as a hobby. I had always been involved in the arts in doing sculptures and paintings so making candles was an extension of my artistic talents. I didn’t become serious with it until after making candle favors for my sister’s wedding and the guest were amazed how beautiful the candles were and the fact I made them. So I slowly began to create different style candles and took pictures of each of my designs and created a catalog. 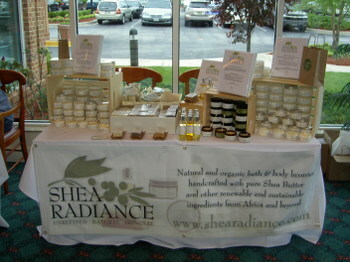 My retail business began to grow. What drew me to making candles was the constant disappointment in purchasing candles from the store. The candles either burned poorly or didn’t have a scent throw. So these let my curiosity in making candles that smelled good while burning. I started out making paraffin candles and that didn’t last long because it was so hard to clean up. Then I learned about gel candles and this wax enabled me to be extremely creative with embedding objects in the candle. After about 4 years, I had my son and wanted something more natural and around this time a friend introduced me to all natural bath & body products. From this introduction I began research again on natural candles and fell in love with soy candles. Soy wax is a natural and biodegradable product. It burns cleaner, longer and cooler than traditional candles on the market. The big plus that my customers love is when you blow out a soy candle it doesn’t have that fume smell that paraffin candles give off…soy wax actually has a sweet aroma when blowing out the flame. When we purchase a soy candle we also support our own American farmers. Kandle Indulgence Co. products can help you to relax with two of our most popular fragrances: Lavender Chamomile Tea and Quiet Time. These fragrances are made using a blend of essential oils and nature-inspired fragrance oils to promote relaxation and sooth minor headaches. Our candles alone offers relaxation through the soothing aroma throughout your home and the intimate glow it provides. My company offers natural dye free soy candles using premium grade vegetable-base fragrance oils, lead-free cotton wicks. We offer a wide selection of container candles, gourmet pillars, votives, tea light candles and one of our best sellers is the Soy Aroma Melts. We primarily do business-to-business sales servicing a lot of private labeling to other companies wishing to carry our product line. 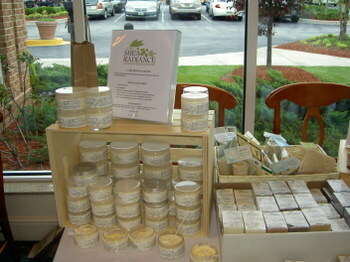 For our retail customers, our business is primarily done online through our website: www.kandleindulgence.com. We provide services for fundraisers, candle favors and home/online parties. We all know that as women, we tend to carry a higher burden of stress than we should. If you are like me, you are continuously multi-tasking and have so many balls up in the air at any given time. There are the needs of spouse and children, a job, business, friends, church and other social obligations that can keep us spinning our wheels. Studies have shown that often we aren’t even aware of our stress levels. Listen to your body, so that you know when stress is affecting your health. Maintaining high stress levels is harmful to your health and also compromises the quality of care you give to your loved ones. I know when I am stressed, I am less patient with those who are closest to me. Taking time out for yourself may at first seem like a selfish thing to do in light of all the demands on your time. You will find that this time investment in you well being yields dividend of a happier, more relaxed more productive wife, mom friend and worker. Give yourself Permission to Relax: I know this easier said than done, but you must develop this as a discipline. Give your self permission to take time out for at least 15 – 30 minutes a day. Take a walk outside, take a few minutes to sit, listen to soothing music, or read a book. Hubby and I jumped on the greyhound bus at 6:00 am on Tuesday morning heading for New York City. This is our first time attending one of the HBA Global Expo events. We decided to make a day trip down to the event to get a feel for the event and checkout the latest trends in the personal care business. We were not disappointed. There were literally thousands of exhibitors showing off the latest designs in packaging, lot's of eco friendly packaging ideas. There were also manufacturers of natural and organic skincare/cosmetic bases and supplies. We spent the whole day going from one exhibit stand to another. Made lots of good contacts and came back home to Maryland, exhausted but inspired. If you are an indie in the personal care business you owe it to yourself to attend this event next year. Hubby getting his caffeine fix at the Au Bon Pain at the New York Port Authority. HBA is the definitive event for the cosmetic, fragrance and personal care industry. In 1993 HBA Global Expo was launched as the only event in North America to address the marketing, technical and naturals needs of the entire beauty industry. For 15 consecutive years, the show has created an international marketplace bringing together suppliers and buyers in the beauty industry's number one marketplace -- New York City. HBA's educational conference program is renowned for providing cutting-edge information on the latest industry trends, new product developments, marketing and advertising know-how, as well as the latest in packaging design and technical advancements. HBA offers midyear conferences focusing on Marketing, Technical and Naturals. The year's most classic, daring and truly provocative designs are honored at the HBA International Package Design Awards. Hundreds of packages vie to be named the year's Category Leader in Personal Care, Skin, Fragrance and Cosmetic packaging for all types of price points and level of distribution. Since its debut, HBA has become a premier gathering place for the entire beauty industry. Showcasing everything from formula to finish, HBA Global Expo includes an increasing number of private labels, raw materials and ingredient suppliers, and contract fillers. Gross Exhibit Space: 228,000 sq. ft.